Spinal cord injury (SCI) is damage to the spinal cord that causes changes in its function, either temporary or permanent. These changes translate into loss of muscle function, sensation, or autonomic function in parts of the body served by the spine below the level of the lesion. It is a life-threatening condition that gives rise to high risk of mortality and morbidity. The global annual incidence of SCI is 40–80 cases per million population. In India, incidence of SCI is 15 new patients per million population (according to conference of spinal injury management in 1995). In India, the major reason for SCI is accidental fall which accounts for 53% of SCI, whereas road traffic accidents and other injuries leading to SCI are 28% and 19%, respectively. Spinal injuries most frequently occur in the neck (cervical) and lower back (thoracic and lumbar) areas. A cervical injury may affect breathing as well as movements of the upper limbs and lower limbs (tetraplegia and paraplegia). SCI is a serious medical condition that causes functional, psychological, and socioeconomic impairment. The long-term secondary complications after SCI include respiratory complications, cardiovascular complications, urinary and bowel complications, spasticity, pain syndromes, pressure ulcers, osteoporosis, and bone fractures. Patients affected with SCI often taken medications such as anticholinergic drugs, drugs used for muscle spasm, and neurogenic bladder problems resulting in xerostomia which is strongly associated with formation of dental plaque hence leading to the formation of dental caries. In some patients, smoking aggravates xerostomia by reducing the salivary flow. Tobacco use, specifically the smoking form, is common in people with SCI. Smoking impedes the ability to heal soft tissue and bone, which in combination with an increased number of periodontal pathogens found among smokers, can be contributing to periodontal disease. Smokeless tobacco use results in recession of the gums and root exposure causing periodontal breakdown and risk for dental caries. Hemiplegia and quadriplegia leave individuals with severe physical handicaps. Disabled individuals have usually revealed gingival and dental health problems with significantly poorer oral hygiene compared to the nonhandicapped. Adults who reported mouth dryness were more likely to have self-reported signs of loose teeth, bleeding gums, cavities, or broken teeth and symptoms of toothache, sensitive teeth, chewing problems, bad breath, or unpleasant taste in mouth. Some SCI patients use mouthstick for driving and controlling devices which may cause occlusal and oral tissue trauma. Altered mood and depressive symptoms prevalent in patients with SCI may lead to further periodontal complications. Adults with SCI often face numerous obstacles in obtaining regular dental care services, including high cost, dental fear and anxiety, physical barriers (wheelchair-inaccessible dental offices), limited transportation, lack of dentists specializing in oral health needs of this population, and limited knowledge of oral health issues. In SCI patients, dental anxiety is due to inaccessibility to dental office environment and asphyxiation is due to impaired respiratory musculature while undergoing dental treatment. People with SCI accompanied with socioeconomic disadvantage are more likely to experience none unmet oral needs. Oral health problems have considerable negative effects on quality of life. Hence, it is essential to study the existing oral health status of the participants with SCI and to provide interventions at the earliest to improve the oral health invariably improving their general health. Patient education by dental and medical providers should emphasize on awareness of the side effects of xerostomia-causing medications, management of dry mouth, and smoking cessation as well as proper oral hygiene. The main aim of this systematic review is to assess the oral health status of patients with various level of SCI. This review was conducted in accordance with Preferred Reporting Items for Systematic Reviews and Meta-Analyses (PRISMA) guidelines. The research topic used to assess the oral health status of SCI patients. Outcome – Assessment of various variables of oral health status such as oral hygiene status, dentition status, periodontal status, and prosthetic needs in various levels of SCI. Studies which was written in English language were only included. Reviews, expert opinion, and case studies were excluded. The data extraction from the final five articles was done using a data extraction form. It included the first author name, year of publication of the article, study population, type of spinal injury, objectives of the study, study design, method of obtaining relevant information (assessment tool), results and primary outcome, and author's conclusion. The final analysis included four cross-sectional studies and one case–control study [Flowchart 1]. The methodological quality of the selected articles was assessed using the effective public health practice project 1998, quality assessment tool for quantitative studies which has six components of selection bias, study design, confounders, blinding, data collection methods, and withdrawal/dropouts. Each component was classified as strong, moderate and weak. The search generated a total of 610 articles from different electronic bases, i.e. PubMed (117), Google Scholar (427), and Trip database (66), respectively. 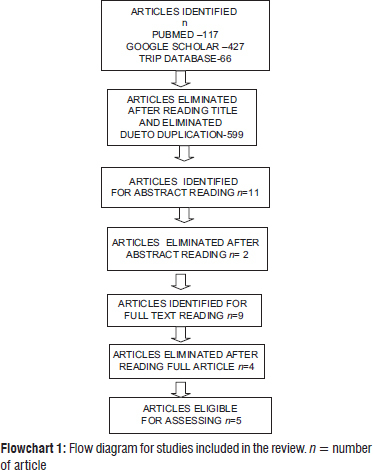 PRISMA (2009) guidelines regarding the paper selection are represented as flowchart. The full texts of nine articles were obtained for further review. On the basis of inclusion and exclusion criteria, five articles were included in the final analysis for the systematic review. The included studies assessed the oral health status of SCI patients and factors limiting the access to dental care among those patients. All the studies reported were descriptive cross-sectional studies except study done by Pakpour et al. (2016) which was a case-control study. ) Quality assessment (selection bias, study design, confounders, blinding, data collection methods, and withdrawal/dropouts)of included studies were tabulated as seen in [Table 1]. The population assessed in all the studies were adult patients with SCI [Flowchart 1]. A study by Sullivan et al. (2013) assessed that the various predictors for oral health which included socioeconomic, injury-related, and oral habit variables were used for predicting oral health score (OHS); decayed, missing, and filled teeth (DMFT) score; and periodontal screening and recording (PSR) index in SCI patients. In that study, regarding daily oral habits, 84% reported brushing teeth, 48% rinsing mouth, 14% flossing, 33% tobacco use, and 13% mouthstick use. Only 32% had teeth cleaned within the past year. On oral examination revealed three decayed and eight missing teeth on average, with prominent periodontal disease (64%). Further only one study by Pakpour et al. (2016) assessed the oral health-related quality of life (OHRQoL) by using the oral health impact profile (OHIP-14) which consisted of 14 questions in 7 domains (2 items per domain) which comprised functional limitation, psychological discomfort, physical disability, psychological disability, mental disability, social disability, and handicap while assessing the perceived impact of oral health on SCI patients. In that study, SCI patients exhibited significantly higher DMFT scores than the healthy individuals (mean ± SD = 17.2 ± 8.7). Except for the decayed teeth, SCI patients had a greater number of missing and filled teeth when compared to the healthy individuals. With respect to periodontal status, community periodontal index (CPI)-3 and CPI-4 denoting pocket formation were predominantly found in the SCI patients. Furthermore, periodontal health as assessed by gingival index was poorer in SCI patients compared to the healthy controls. In addition, the mean score of dental plaque of SCI patients was significantly higher than the healthy controls. Vasudha Khattar (2009) assessed various oral health needs that include D assessment of oral health status (oral hygiene, tooth mobility, denture status and denture need, lesions of the oral mucosa, and oral health needs assessment). In that study results, the level of oral health of SCI patients was fair. The overall level of edentulousness was 1.7%, the need of restorative treatment and extractions was 8.2%, and the assessment of treatment needs revealed that 81% of the study population required dental care. A study done by Yuen et al. (2010) assessed barriers for dental care in SCI, which included wheelchair-inaccessible dental offices, limited transportation, lack of dentists specializing in oral health needs of this population, and limited knowledge of oral health issues faced by persons with SCI. In that study results, approximately 47% of participants reported having oral problems at the time of the survey, and 42% reported experiencing oral pain within 12 months before the survey date. Oral problems and oral pain were positively associated with dry mouth symptoms, financial barriers to dental care access, smoking, and paraplegia. Study population, study design, objectives, assessment tool, outcome, and summary of these included studies were tabulated as seen in [Table 2]. In the present review, search based on PRISMA guidelines narrowed down on a set of four descriptive cross-sectional studies and one case–control study that suggested an outcome on oral health status of SCI patients. In SCI patients, injury to the corticospinal projection system provokes a deficit of manual dexterity. The decreased dexterity due to poor muscle coordination, complicated medical condition, makes their tooth brushing and oral hygiene maintenance difficulty. Loss of hand function is a particularly devastating aspect of SCI that patients associate with a reduction in quality of their life. SCI leave individuals with severe physical handicaps. Disabled individuals have usually revealed gingival and dental health problems with significantly poorer oral hygiene. Spinal Injuries are classified in general terms of beingneurologically”complete” or “incomplete” based upon the sacral sparing definition. In SCI patients, Xerostomia which occurs due to various medications is strongly associated with formation of dental plaque and further formation of dental caries. In this review, all the studies included were SCI patients in both complete and incomplete level of injury. Pakpour et al. (2016) stated that SCI patients had poor oral hygiene practices, greater levels of plaque, gingival bleeding, and caries experience than the healthy controls. Khattar et al. (2009) also stated that the level of oral health in SCI patients was fair. A large number of SCI patients needed periodontal care and dental treatment. In addition, more number of SCI patients had periodontal pockets and dry mouth than the comparative group. The reason for poor oral hygiene could be the medications usually prescribed in these patients to treat muscle spasms, and neurogenic bladder disorders might lead to dry mouth which, in turn, leads to increased accumulation of dental plaque and also dental caries. Second, these patients restrain themselves from performing regular oral hygiene as this needs extra efforts and specialized equipment such as arm supports, universal cuffs, or splints. Pakpour et al. (2016) stated that SCI patients had poorer OHRQoL than the comparative group. All the oral findings had a significant negative effect on OHRQoL; participants with dry mouth, greater caries levels, and periodontal pockets reported greater OHIP-14 scores (poor OHRQoL). It is evident that the clinical oral health status is significantly related to OHRQoL. However, plaque and gingival bleeding were not related to OHRQoL. The reason for poorer oral hygiene in SCI patients are due to secondary health problems, dependence on others for their needs, and limitation in regular movement. Limited movement and dependence on caregivers hinder the performance of regular general hygiene and also oral hygiene in SCI patients. Sullivan et al. (2013) stated that oral health appears to be compromised in people with SCI, which suggests the need to focus more attention to the provision of adequate dental and periodontal care to this population. The reason for compromised oral health after SCI was employment before injury and behaviors that heighten the risk for compromised oral health (not flossing, not rinsing, tobacco use, and mouthstick use). These factors predicted both the participants' self-assessment of OHS and the formal examination of periodontal disease (PSR). Older age was the only predictor of DMFT, in agreement with the findings in the general population. Yuen et al. (2009) stated that there was no significant difference in the proportion of participants with SCI who visited the dentist for any reason in the past year compared to the general population. The most common barrier to accessing dental care was high cost followed by physical barriers and dental fear. Other barriers included wheelchair inaccessibility to dental office, examination room, or dental chair, and lack of transportation prevented them from receiving dental care. Respondents with dental insurance had slightly better odds of going for an annual dental visit (including professional cleaning) than those with no insurance. Those who reported brushing teeth less often than twice a day were twice as likely not to visit the dentist in the past year compared to those who reported brushing at least twice a day. Of the three major barriers that limited dental access among persons with SCI, physical barriers may be the factor most under the control of dental health professionals. Caregiving services in SCI patients were predominantly provided by informal caregivers. Quality of care by informal caregivers matches with formal caregivers. The role of caregivers in SCI patients is to improve oral health by brushing their teeth and flossing their teeth every day, make them to visit a dentist regularly, rinse the dentures after every meal, and brush them daily with dental cleaner. If the SCI person had dry mouth, providing alcohol-free mouth rinse can help them keep hydrated. The quality of the evidence included in this systematic review was affected by a number of methodological issues. First, there was marked heterogeneity of the studies selected and included. The sample size of some studies was small, while some studies did not report the statistical procedure of sample size calculation or justified the sample size used in their studies. This review may not be comprehensive because those studies published in Japanese, Chinese, Spanish, or Portuguese were not included and only English articles were considered in this review. For some studies, blinding of outcome measurement was either not achieved or not mentioned by the researchers. Longer observation periods are required to measure periodontal changes. In SCI patients, poor oral hygiene practices, greater levels of plaque, gingival bleeding, and caries experience were noticed. Since the resources are limited, it becomes even more essential that oral hygiene instructions should be given to these patients and the caregivers should be trained adequately to maintain the oral hygiene of these physically compromised patients. Henceforth, for further evaluation of the oral health status and OHRQoL, barriers faced by dental care studies of better standards/designs are recommended. Jason C, Eck DO. MS Spinal Cord Injury. Available from: https://www.medicinenet.com/spinal_cord_injury_treatments_and_rehabilitation/article.htm. [Last accessed on 2018 Apr 10]. Srivastava RN. Epidemiology of traumatic spinal cord injury: A SAARC perspective. Int J Mol Biol Biochem 2015;3:9-22. Mathur N, Jain S, Kumar N, Srivastava A, Purohit N, Patni A, et al. Spinal cord injury: Scenario in an Indian state. Spinal Cord 2015;53:349-52. Khattar V. Oral health needs assessment of adults with spinal cord injuries resident in an institution. Indian J Public Health Dent 2009;7:30-6. Yuen HK, Shotwell MS, Magruder KM, Slate EH, Salinas CF. Factors associated with oral problems among adults with spinal cord injury. J Spinal Cord Med 2009;32:408-15. Riley JL 3rd, Tomar SL, Gilbert GH. Smoking and smokeless tobacco: Increased risk for oral pain. J Pain 2004;5:218-25. Sullivan AL, Bailey JH, Stokic DS. Predictors of oral health after spinal cord injury. Spinal Cord 2013;51:300-5. Pakpour AH, Kumar S, Scheerman JF, Lin CY, Fridlund B, Jansson H, et al. Oral health-related quality of life in Iranian patients with spinal cord injury: A case-control study. Injury 2016;47:1345-52. Yuen HK, Wolf BJ, Bandyopadhyay D, Magruder KM, Selassie AW, Salinas CF, et al. Factors that limit access to dental care for adults with spinal cord injury. Spec Care Dentist 2010;30:151-6. Quality Assessment Tool for Quantitative Studies Effective Public Health Practice Project. Quality Assessment Tool for Quantitative Studies. Hamilton, ON: Effective Public Health Practice Project; 1998. Available from: https://www.merst.ca/ephpp. [Last accessed on 2018 May 02]. Kirshblum SC, Burns SP, Biering-Sorensen F, Donovan W, Graves DE, Jha A, et al. 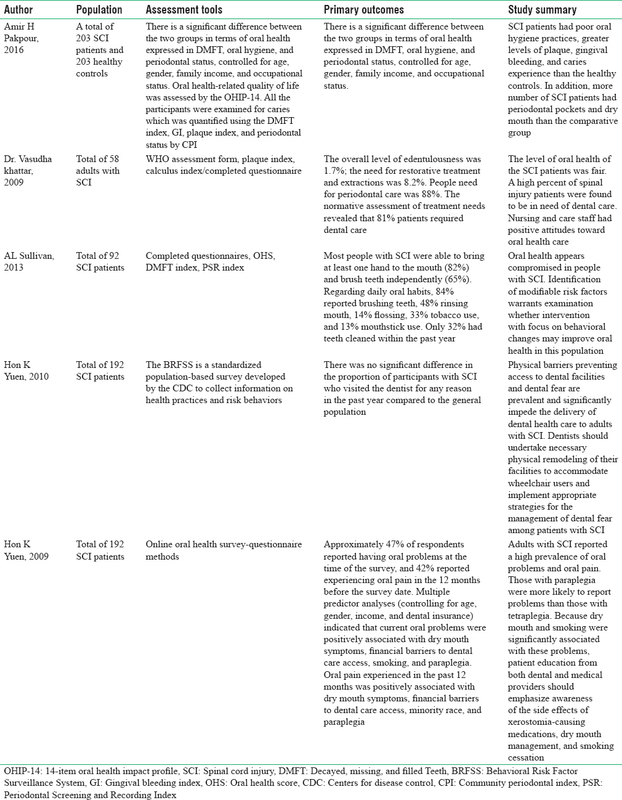 International standards for neurological classification of spinal cord injury (revised 2011). J Spinal Cord Med 2011;34:535-46.